The German share price index, DAX board, is seen at the stock exchange in Frankfurt, Germany, October 2, 2017. LONDON - European shares dipped on Wednesday despite a new set of record highs overnight on Wall Street, with Spanish and banking stocks suffering from the on-going Catalonia crisis, while Germany’s DAX was catching up after a bank holiday, boosted by strong auto stocks. The pan-European STOXX 600 index was down 0.1 percent by 0735 GMT while Spain's IBEX fell 0.9 percent as banking stocks, the most sensitive to political risks, tumbled. Catalonia-headquartered Banco Sabadell led the IBEX lower, down 2 percent, closely followed by Bankia, Bankinter, Santander and BBVA. Spanish banks weighed on the euro zone banking index .SX7E down 1.2 percent and set for its worst fall in two weeks with all stocks in the red. King Felipe VI accused secessionist leaders of shattering democratic principles in a rare televised speech which, in itself, is a sign of the seriousness of the crisis, analysts said. Energy stocks .SXEP, down 0.4 percent, also weighed as crude prices slipped. Buoyed by strong data in the United States, car makers boosted Germany’s DAX .GDAX, up 0.4 percent, with Volkswagen rising 2.2 percent and Daimler rising 1.5 percent. 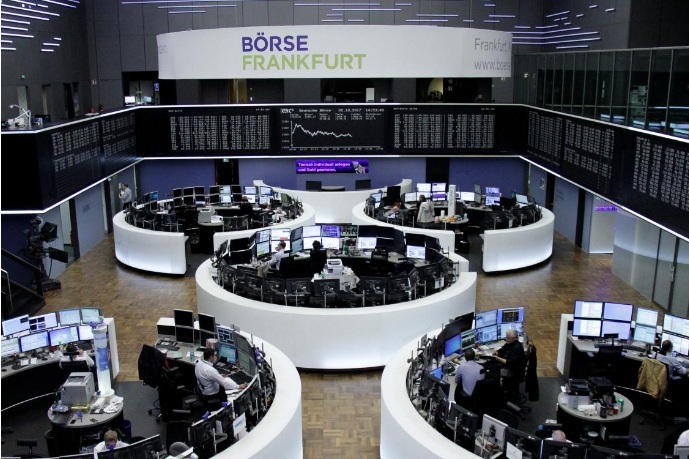 European shares dipped on Wednesday despite a new set of record highs overnight on Wall Street, with Spanish and banking stocks suffering from the on-going Catalonia crisis, while Germany’s DAX was catching up after a bank holiday, boosted by strong auto stocks.